Suffused with Russell Banks’s trademark lyricism and reckless humor, the twelve stories in A Permanent Member of the Family examine the myriad ways we try—and sometimes fail—to connect with one another, as we seek a home in the world. In the title story, a father looks back on the legend of the cherished family dog whose divided loyalties mirrored the fragmenting of his marriage. “A Former Marine” asks, to chilling effect, if one can ever stop being a parent. And in the haunting, evocative “Veronica,” a mysterious woman searching for her daughter may not be who she claims she is. Moving between the stark beauty of winter in upstate New York and the seductive heat of Florida, Banks’s acute and penetrating collection demonstrates the range and virtuosity of both his narrative prowess and his startlingly panoramic vision of modern American life. A resounding collection by an essential American writer. 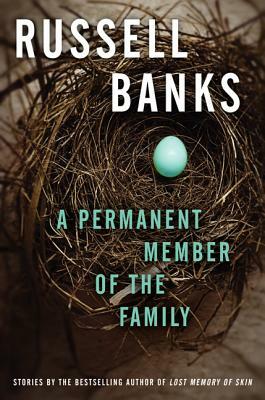 Banks is a master of the kind of old-school, unadorned realism that hasn’t really been the fashion in short stories since the days of Raymond Carver.